Home > Heavy Duty V Belts > Poly-V Ribbed (Micro -V) Belts > J, PJ Section Poly-V (Micro V) Belts - 3/32" Rib Width. > 170J2 Poly-V Belt, Metric 2-PJ432 Motor Belt. > 170J5 Poly V Belt. Metric belt 5-PJ432. 170J5 Poly V Belt. 17" Length (432mm), 5 Ribs. 170J-5 Drive Belt. Metric belt 5-PJ432. Heavy Duty drive belt made by BANDO USA. Replaces BAN170J5, Gates 170J5, Carlisle 170J-5, PJ432 5 Ribs, Goodyear 170J-5. Used where strength and durability are crucial, eg. Fitness Machine Drive belts, Electric Motor belts, Treadmill belts, and Appliance belts. 170J2 Belt (2-PJ432). 170J-2 Poly-V (Micro-V) Belts. 17� Length. J Section Motor Belt replaces fitness belts, compressor belts, drive belts, and electric motor belts. 170J-2 Poly-V Belt. 170J3 Belt (3-PJ432). 170J-3 Poly-V (Micro-V) Belts. 17� OC Length: J Section Motor Belt replaces fitness belts, compressor belts, drive belts, and electric motor belts. 170J-3 Poly-V Belt. 170J4 Belt (4-PJ432). 170J-4 Poly-V (Micro-V) Belts: 17� OC Length: J Section Motor Belt replaces fitness belts, compressor belts, drive belts, and electric motor belts. 170J-4 Poly-V Belt. 170J5 Poly-V Belt, Consumer Grade. Metric 5-PJ432 Motor Belt. 170J5 Belt (5-PJ432). 170J-5 Poly-V Belt, 17� OC Length. 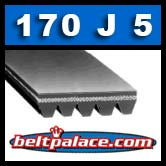 170J Section Motor Belt replaces fitness belts, compressor belts, drive belts, and electric motor belts. 170J-5 Micro-V Belt.